The Great Rescue. Treating and caring for the wounded and sick in armed conflict, other major violence and natural disasters have always been number one priority for the International Committee of the Red Cross (ICRC). Tyler and Maria are doctors working for this humanitarian organization. Their job is to visit places of detention as part of a team of ICRC. But, this is a stressful job. They are constantly under pressure in a potentially dangerous environment. So, Tyler and Maria are again on a mission is to visit the endangered and poor regions of the world that need expert assistance. Today, they arrive together with their team in a small, deserted town where there is an outbreak of disease that can spread rapidly and kill thousands. During an epidemic the disease will normally spread in two weeks or less. They must do everything to prevent the spread of this epidemic. They must examine everything relating to individual and collective detainee health and find all related objects which are well hidden. Let`s move quick and help Tyler and Maria rescue this small town! 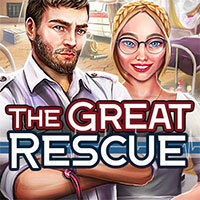 The Great Rescue is a free online hidden object game on Hidden4Fun.